These days you don’t need to wear a burlap sack to pay homage to the environment. In fact it’s getting harder and harder to be fashion forward and resist lending your support. Walk into Barney’s hoping to indulge in expensive designer threads, to Levi’s for the latest denim, or to Nike for high-performance workout gear and you are bound to encounter organic clothing masquerading alongside its traditional counterpart without even the slightest hint of disparity. Catering to a society a-buzz with a renewed sense of environmental responsibility, organic textile manufacturers have entered a ripe marketplace hungry for new organics. Moving beyond the limitations of a dull reputation, eco-friendly clothing has become more than a viable option, but a stylish one too. As consumers continue to spend more of their dollars on organic products, retailers continue to meet their demands, bringing more and more organics to market. There’s no question the sweeping demand for eco-friendly fashion is in high gear, but the uncertainty of its longevity remains. Given the fickle taste of consumers, relatively high cost of organic cotton, and limited supply of the crop, we must ask ourselves, is our newfound interest in sustainable clothing sustainable? On the heels of the organic health food revolution, an interest in organic clothing seems to be a natural next step. What many don’t realize is that the organic apparel movement has been attempting to emerge for more than a decade. A pioneer in organic textiles, jeans giant Levi Strauss unveiled Levi’s Naturals in 1991. The premium, organic jeans were created from naturally produced cotton and utilized all-natural dyes. Catering to a less environmentally savvy market, organic cotton’s first introduction was decidedly before its time, resulting in a flop for Levi’s. Shortly thereafter, a handful of other retailers brought short-lived organic lines to the public, only to discover demand wasn’t great enough to inspire sales. More than a decade later, the organic apparel landscape looks vastly different. Trailing recent environmental feats in the mainstream media, including Live Earth and Al Gore’s film An Inconvenient Truth, among others, organic apparel is finally in the position to successfully permeate mainstream culture. Both responding to and further propelling consumer demand for organic apparel, mainstream retailers are increasing their organic cotton commitments. The Organic Exchange, a charitable organization supporting increased organic cotton agriculture worldwide, reports that organic cotton sales have gone from $86 million in 2001 to $275 million in 2005. Organic cotton sales projections for 2008 are near $2.6 billion, displaying a 116% average annual growth rate. Some retailers attribute the change to corporate responsibility goals, while others more candidly admit to embracing organics in an effort to appeal to consumers. Regardless of motive, change is apparent. Spreading from grassroots to mass-market retailers, and influencing everyone in between, organic initiatives have successfully saturated the apparel industry. American Apparel, Patagonia, Barney’s, Bloomingdales, Levi’s, Diesel, Nike, H&M, Target and Wal-Mart are just some of the retailers who have joined the ranks of the environmentally conscious. A brand famous for perpetual innovation, Nike has held an instrumental role in embracing organic cotton, prompting fellow retailers to follow its lead. Taking an early interest in organics, Nike began exploring organic cotton options as early as 1996 and debuted its first organic line in 1998. After purchasing an initial 250,000 pounds of organic cotton for its first organic products, Nike made a commitment to support the organic cotton industry by increasing their commitment each year. Co-founding the Organic Exchange, Nike has helped to increase supply and consequently lower price points for organic cotton. Producing blended garments along with a small volume of 100% organic cotton products, Nike has continued to increase its commitments and raise the bar for environmentally conscious retailers. Currently blending 5% of organic cotton into more than 50% of their garments worldwide, Nike is aiming to hit a 5% organic-cotton blend ratio in 100% of its cotton garments by the year 2010. American Apparel, a company founded on strong environmental business principles, has focused efforts on creating affordable organic options for consumers. Rolling out its Sustainable Edition organic line in 2003, American Apparel entered organics with a single line of T-shirts. Now available in 10 of American Apparel’s most popular styles, the line has enjoyed tremendous success. Growing steadily each year, it’s estimated that organic garment sales have increased by 40%. Pricing organics at the same price point as traditional cotton apparel, Erika Martinez, American Apparel’s organic programs development liaison, reports that the store spends an extra dollar on each organic garment produced. Martinez explains, “We want people to know that they have an option and to know that the option can be affordable.” Future goals include nurturing the Sustainable Edition and establishing blending techniques. Blending traditional cotton with organic cotton, American Apparel hopes to integrate more organic cotton into its inventory in a cost-effective way. Ultimately hoping to convert to 100% organic apparel offerings, American Apparel is continuously looking to increase organic and sustainability initiatives. With a finger on the pulse of consumers, culture and trends, H&M has re-established organic garments in response to undeniable consumer demand. Originally entering the organic marketplace in the late ’90s, H&M answered early consumer rumblings surrounding organics with sustainable wear. Too premature to generate substantial interest from customers, H&M pulled the line, but its commitment to the organic cotton industry remained. Like Nike, H&M adopted blending techniques, which it continues to use today. In 2004, H&M began blending a sampling of organic cotton into its children’s and baby wear. Also a member of the Organic Exchange, H&M’s corporate responsibility goals include increasing the supply of organic cotton worldwide. Recently joining forces with Stella McCartney, H&M launched an organic line this spring, including an organic T-shirt collection supplemented by a natural corn-based bag. Consumers’ reactions to the line have exceeded projections. This fall, H&M plans to roll out a robust selection of organics sold alongside traditional cotton apparel. In fact, a chief consideration in H&M’s organic offerings will be fashion. Lisa Sandberg, H&M’s director of US communications and press relays, “The clothing will be representative of the whole collection theme. The minimalist trend is very big for the fall, so the organic clothes will also fall into that same category.” H&M has continued to increase its commitment to organic cotton. For its 2007 clothing lines, H&M purchased an estimated 1,100 tons of organic cotton—versus 30 tons in 2006. Adding dimension to the breadth of organic cotton’s infiltration into mainstream culture, Wal-Mart is marketing a slew of eco-friendly options to the masses. Entering into the organic sphere in 2004, Wal-Mart introduced a line of 100% organic yoga wear through its Sam’s Club stores. The initial 190,000 garments sold out in just 10 weeks. Identifying an opportunity, Wal-Mart has continued to increase its commitment to organic cotton. It has been reported that five years ago, the entire organic cotton supply neared 6,400 metric tons. In 2006, Wal-Mart purchased 6,800 metric tons, making the mass retailer the largest buyer of organic cotton to date. Selling over 5 million units of organic women’s wear in the last few years, the decision to move into organic appears to be paying off for Wal-Mart. Lending support to the organic cotton industry and providing security for farmers, Wal-Mart has made a five-year verbal commitment to purchase high volumes of organic cotton. While many stores are jumping onto the organic wagon, the volume of their commitments can’t touch those of large retailers such as Nike and Wal-Mart. The availability and affordability of organic cotton have some catching up to do before many retailers will be able to make significant commitments. Accounting for less than (is it really 0.1 or is it just 1? If it’s the former, we should put a 0 in front to make it stand out more) .1% of the world’s cotton, organic cotton is an expensive commodity. Many retailers have continued to increase commitments, but at relatively small volumes. Given organic cotton’s limited supply, many clothing manufacturers are watching the market for a more financially feasible time to make substantial investments. American Apparel, an early adopter and strong advocate for the use of the crop, currently houses a mere 5% of organic cotton garments in its overall inventory. Terry Young, director of member services at the Organic Exchange, comments that if Nike attempted to swap out all traditional cotton for organic, there wouldn’t be enough organic cotton in the world to support the shift. Bringing education, planning and support to farmers, The Organic Exchange is paving the way to a sustainable, widespread system. Targeting aggressive growth goals, the Organic Exchange is hoping to increase organic farmland by 50% each year. Primarily grown in India and Turkey, US farmers have been slow to convert their traditional cotton crops to organic. After watching fellow farmers prematurely respond to trends in the ’90s, many farmers remain gun-shy, waiting to react until the longevity for today’s organic cotton demand is substantiated. Additionally, going organic in the US can be a difficult move. In order to certify crops as organic, a three-year farm transition period is required. Prior to recent changes made to the Farm Bill, farmers were required to endure three years of organic cotton production without charging organic cotton prices or advertising their crop as such. Hoping to assist farmers in making the transition and to alleviate some of the growing pains of going natural, the government has started to better support farmers. This year’s Farm Bill allocated a substantial amount of money to organic farming education, and has allowed farmers moving into organic production to advertise crops as “transitional”—all signs of a healthy, long-term growth potential. Supporting international growth will require a new way of structuring relationships and commitments with cotton growers. Currently Nike has contracts with mills abroad, but its commitments don’t reach back to the farms. The mills purchase the cotton crop directly from the farms, spin it, mark it up, and sell it to retailers. The considerable mark-up isn’t supporting farmers. Instead, the current system maintains the risk at the farm level, without much of the profit. Retailers can help to support the growth of organic farms by making commitments directly back to landowners. Marks and Spencer, an English retailer, has pioneered a model for a healthy sustainable relationship with farms by making a commitment to a farm in northern India. Under a mutually beneficial arrangement, the farm has the security of a forward contract and Marks and Spencer is able to secure lower prices for organic cotton in a tight market. Now showing signs of stability, the demand for sustainable, eco-friendly clothing has enjoyed healthy, consistent growth. As the US government begins to back domestic cotton producers, as retailers activate mutually beneficial relationships with cotton growers overseas, and as education and outreach initiatives successfully reach farmers, the organic cotton industry will only continue to grow. While retailers wait out the market adjustment to the supply and pricing of organic cotton, they have started to embrace other eco-friendly solutions as well. Materials such as bamboo and recycled fibers have taken off in smaller, eco-friendly stores, and are just starting to break into the mainstream market. Providing a wealth of functionality, bamboo is a versatile natural resource. Requiring only five years to reach harvest-ready maturity (versus decades for most trees), bamboo is naturally resistant to pests and is one of the most rapidly renewable resources on the planet. Used for a broad array of purposes, bamboo’s state and properties vary greatly. In its most natural form, the dense grass can be used as tough, resilient building material. When broken down into fiber, bamboo takes on quite a different set of characteristics. Woven together, the gentle fibers yield a smooth yarn used to make soft, comfortable fabrics. The delicate quality of bamboo clothing is often compared to silk or cashmere. Clothing manufactures have started to explore bamboo because of its sustainable nature and inherent softness, but the fiber has many other benefits as well. Bamboo fabric is known to be breathable, fast-drying and odor-free, making it an attractive eco-friendly material for retailers to include in their lines. Ranging in use from bamboo denim to bamboo camisoles and intimate apparel, bamboo might just be the next wonder fiber. Recently reporting plans to incorporate bamboo into their basketball shoes, Nike is set to replace the plastic heel cup on select shoes with bamboo instead of the foam lining currently employed. American Apparel has also reported experimenting with bamboo fibers and hopes to integrate the new material into their lines, broadening their Sustainable Edition. 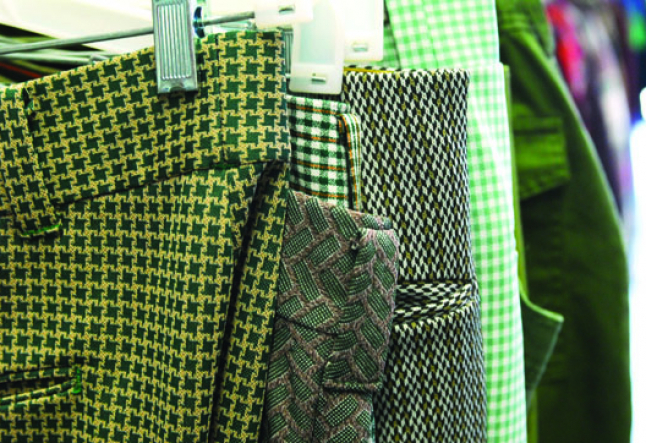 For the inclusion of easily accessible, sustainable resources, retailers are also looking to utilize recycling techniques to regenerate worn-down garments into new clothing. Both American Apparel and Patagonia have already unveiled recycled products in their inventories, and both retailers hope to broaden offerings in the future. Rolling out the Common Threads Recycling Program in 2005, Patagonia invited customers to hand in old Patagonia garments to be recycled into fresh apparel. Expanding the program in the last two years, Patagonia now invites customers to recycle any old clothing, free of restriction, making Patagonia the first company in history to recycle its competitors’ products. Restoring garments has allowed Patagonia to curb petroleum use, which has resulted in a 76% energy savings throughout the recycled-garment manufacturing process, also resulting in a 71% lower CO2 emissions rate. Patagonia president and CEO Casey Sheahan has been quoted as saying, “We hope to expand the world view of recycling beyond just aluminum cans, newspapers and bottles. We're aiming to make clothing a recyclable resource.” Patagonia also looks to produce recyclable clothing. By the fall of 2007, it’s estimated that nearly 1/3 of all apparel sold in the store will be recyclable. American Apparel has also started to incorporate recycled products into its stores this year, and plans to increase initiatives in the future. Replacing its traditional beanie line with all recycled beanies, American Apparel has joined Patagonia in limiting waste at a fundamental level. Fabric scraps are deduced down to the fiber state, and then spun back into yarn. All recycled materials are initially divided by color, so they don’t require re-dying or the need to be treated with heavy chemicals. The recycling process is a more natural, organic process and consumers are benefiting from the elimination of toxic treatments. American Apparel expects the recycled beanies will be successful and looks forward to continuing to supply eco-friendly options for consumers. Now ready to make a lasting environmental impact, both retailers and consumers are starting to make everyday decisions that are changing the landscape of the apparel industry. As stores both meet and increase the demand for sustainable clothing, more and more eco-friendly materials and practices are being generated. From the increased volume of organic cotton to the use of bamboo fiber and recycled clothing, retailers are continuing to provide an expanded array of environmentally sound options. Showing enthusiasm for the amplified source of sustainable choices, consumers are putting rumors of an eco-fad to rest, actively making deep-rooted change one environmentally friendly purchase at a time. Learn more about Green Living? Click here.